We often hear about communication in the workplace, but it’s usually within the context of an office environment. What about the significant portion of our workforce that is involved in non-office occupations, such as trucking? 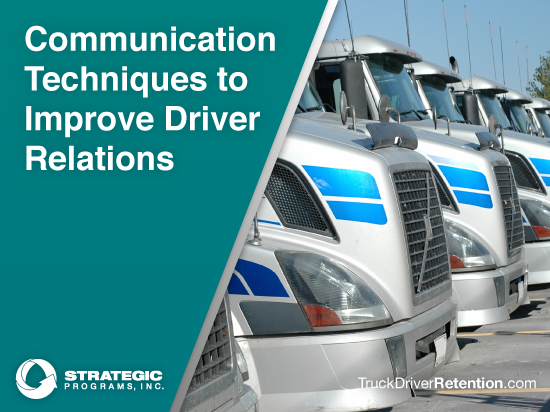 Discussing methods to improve email communications or team meetings loses some of its luster when you realize a considerable portion of a transportation company’s workforce is on the road most of the time. So what does work? Well, in the past we have discussed the importance of feedback and having an open door policy, but today we are going to look at a few other ideas to engage our drivers. When it comes to communication, it needs a basic foundation of trust to be received. If that trust isn’t there, then people will consciously or unconsciously filter what they hear. I can vividly remember picking up a group of workers from another organization. The former employer had treated the employees poorly, which meant nothing that I said or did was fully registering with them. It wasn’t until much later that those bonds of trust began to form and we were able to truly realize the value of those employees. The sheer impact of distrust is especially painful in the trucking industry. “[Most] drivers don’t trust that the company cares about them. People feel like their voices are being lost and their concerns aren’t acknowledged,” said Rim Yurkus, CEO of Strategic Programs, Inc.
One of the best ways to build trust early on is to meet with new drivers and establish expectations on both ends. What does your driver expect from you? What do you expect from them? Having this conversation with each new driver goes a long way toward building trust. Another great way to build trust is by determining best methods for communication. More on that next. I’ll never forget the time I observed a Vice President addressing a group of our front line workers. He was using jargon and complex language that might be fine for the board room, but the workers weren’t getting it. In the end, he ended up alienating more people than he reached with the act. Think about the drivers on your team. How do they talk? What is important to them? Discuss those things. This isn’t necessarily a call to “dumb down” what you’re saying–it’s a suggestion to engage them by using the communication style they are comfortable with. This might not always come easily, but it can pay dividends in the long run. “Working out these issues and putting effort in to how to speak with people who have different communication styles is well worth the effort,” added Younkin. One of the greatest pieces of leadership advice I ever received was to be genuinely curious about my people and the work they did. This is not an excuse for micromanagement or being overbearing. Instead, it’s a way to get more insight into what motivates people, what they find interesting, and how you can best engage with them. The book Turn The Ship Around provides an excellent illustration of this concept. The lowest-rated submarine crew in the US Navy received a new captain, and his management style was to encourage autonomy while asking helpful questions to allow people to come to their own conclusions. His natural curiosity and friendly manner helped to abate any potential sense of micromanagement while still getting results. Just a short time after the new captain took charge, the vessel received high ratings for its performance, a testament to the value that comes from this type of communication style. Each of these is a helpful piece of advice in its own right, but when combined, you can quickly see how the synergy can play out. Being naturally curious about your team’s work will build trust over time. And through that exercise and interaction, you’ll brush up on their language and preferred communication styles, honing the relationship and engaging staff in new ways. The end result is a better connection between your leaders and drivers.